Polluted air killed seven million human beings in 2012. So concludes a new report from the World Health Organization, which also found that one-third of the deaths occurred in Asia. Air pollution is now Earth’s most dangerous environmental threat to health, the WHO study says, and it accounts for one out of every eight deaths. 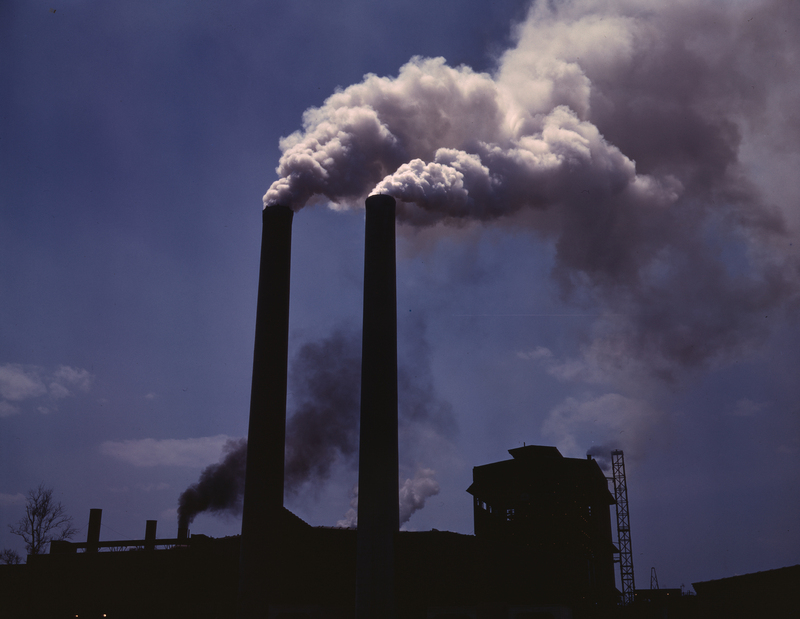 Emissions of pollution to the atmosphere raises the risk that individuals will suffer heart attacks, strokes, and cancer. About 40 percent of heart disease victims and about 40 percent of stroke victims die as a result of outdoor air pollution. Indoor air pollution, such as from smoke and soot, accounts for 34 percent of stroke deaths and 26 percent of ischemic heart disease fatalities. Overall, WHO estimates that 4.3 million people died as a result of exposure to indoor air pollution, while 3.7 million individuals perished due to outdoor air pollution. “Cleaning up the air we breathe prevents noncommunicable diseases as well as reduces disease risks among women and vulnerable groups, including children and the elderly,” Dr. Flavia Bustreo, a WHO assistant director with oversight of general family, women’s, and children’s health, said in a statement. 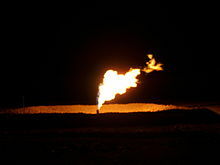 This photograph of a natural gas flare was taken in North Dakota. Image courtesy Wikimedia. A study published Feb. 14 indicates that the nation’s principal air quality regulator is not accurately measuring methane emissions and that conversion of motor vehicles to natural gas and away from diesel fuel is likely to worsen human-caused climate change. That may be an under-estimate. A 2009 paper found that methane has at least 30 times the heat-trapping capability of CO2. 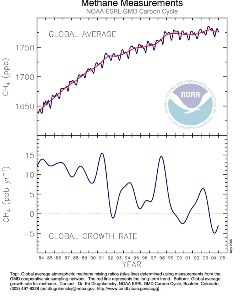 Its prevalence in the atmosphere is now approximately two-and-one-half times what it was during the pre-industrial stage of human history, according to the National Oceanic & Atmospheric Administration, although much less than it was during the first billion or so years of the planet’s existence. “There does appear to be more methane at the national level than we expect to find,” Adam Brandt, an assistant professor of energy resources engineering at Stanford University and the lead author of this month’s paper, said. Brandt found that atmospheric emissions of the powerful greenhouse gas are 25-75 percent higher than the U.S. Environmental Protection Agency estimates. He explained that scientists are not sure of exactly how much of the country’s methane emissions are attributable to the natural gas industry, but that some of it is likely to come from drilling wells, pipelines, and other facilities used to extract and deliver to market a rapidly growing source of energy in the United States. The cause of the industry’s methane leak problem can be traced to about 50 flawed components of the natural gas production system. This month’s study concluded that about 60 percent of methane leaks can be traced to those flaws. Leaks happen for a variety of reasons. Equipment can be defective, for example, and even when it is operating correctly natural gas that is under pressure can easily escape through hard-to-detect gaps and punctures. Some methane is intentionally discharged to the atmosphere. The problem of unintentional leaks poses financial and logistical challenges to operators. Because the industry’s infrastructure is spread out over a large area, and because leaks can come from very small and hard-to-detect flaws in it, the process of tracking them down and repairing them is expensive. Human sources of methane account for about 60 percent of total worldwide emissions and the natural gas industry is not the only source of methane pollution of the atmosphere. Livestock, for example, is a major emitter, as are landfills. Brandt said that his study did not focus on either of these possible avenues of methane pollution. The paper’s conclusion that EPA may have underestimated the discharge of methane occurring in the United States is consistent with several other recent studies. One, published last fall in the Proceedings of the National Academy of Sciences, found that total methane emissions in the U.S. were about 50 percent higher than EPA determined during 2007-2008. Two others that examined local methane emissions in Texas and Utah also concluded that EPA may be inaccurately measuring them. One commonly advocated mechanism for lowering greenhouse gas pollution is the introduction of natural-gas fueled vehicles. But even as the conversion of petroleum fuels in the vehicles to natural gas can reduce their greenhouse gas emissions by about 30 percent, the production of that natural gas leads to more methane emissions. The new study is a synthesis of more than 200 earlier investigations of methane pollution. Titled “Methane Leakage from North American Natural Gas Systems,” it appears in the Feb. 14 issue of Science. Graphic courtesy National Oceanic & Atmospheric Administration.